Don’t Do this. Also, how to deal if you do. Accidents do happen and not all of them can be refocused as a “happy accident.” I forgot to do a thorough idiot check after I was done working last night. Now I have a swamp brush because I left it sitting in the rinse water all night and it is not pretty. 1: Let the brush dry out completely. 2: Remove the cracked paint. I only remove what flakes off by hand but you can scrape it all if you want to. 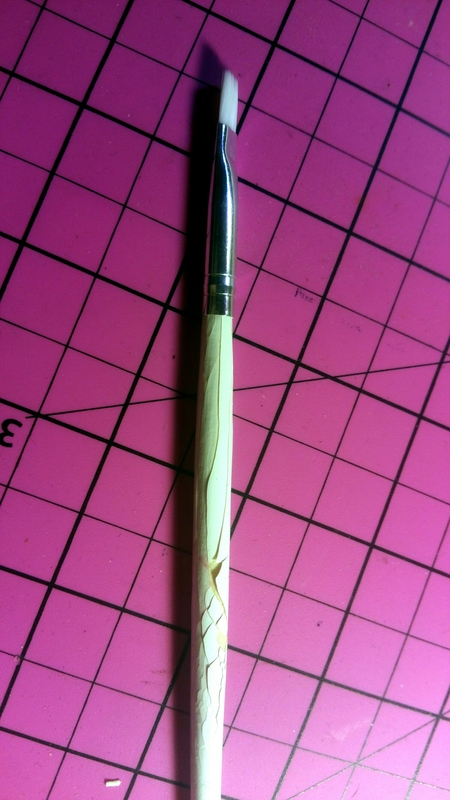 3: If the ferrule comes easily off the handle I remove it but if it is just loose I leave it on. 4: Paint the brush handle. I personally use nail polish to do this because I always have a surplus of it. Then let it dry in a place where it won’t be disturbed. 5: Reattach the ferrule. I add a dab of super glue inside, then I use a pair of pliers to crimp it to the handle until it feels secure. The brush at the top of this post is still drying. I will post a picture of it after its rehab in the comments.